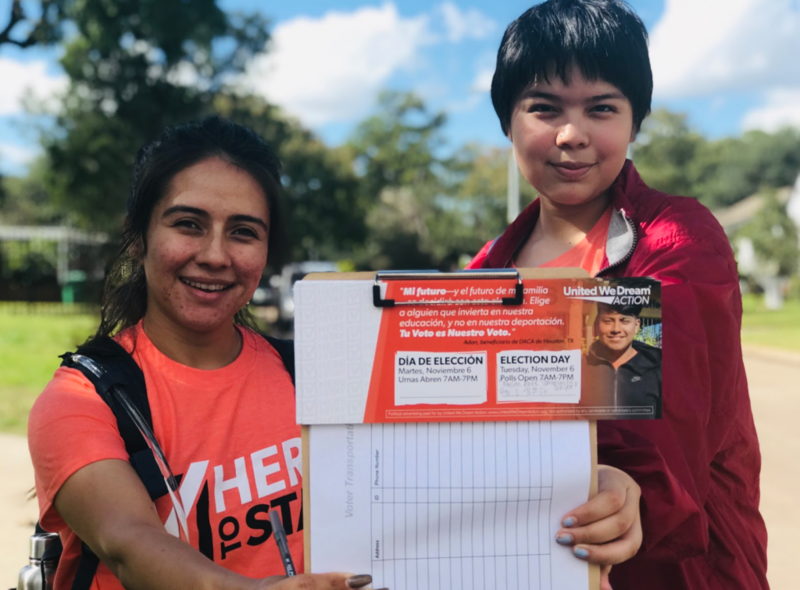 Amid record setting early votes and youth turnout, immigrant youth of Harris County and their allies hit the pavement in communities of color to mobilize voters who might not ordinarily vote in a midterm election. Immigrant youth of United We Dream Action have been in a back-to-back effort of blockwalking, coinciding with online ads exposing Cruz as an enabler of Trump’s mass deportation agenda. After Trump killed the DACA program and the Republican-controlled Congress left them in danger by failing to pass the Dream Act, immigrant youth know how important it is to elect new champions in Congress and are taking their case directly to voters. (Left) Hector and Daniel canvass in a predominantly Black neighborhood in South Houston; (Right) Angulus and Erick, two high schoolers, canvass for Beto O’Rourke & Lina Hidalgo. You can also find videos from this weekend here, here and on our Twitter. “This weekend I talked to a voter who is behind Lina but planned to vote for Ted Cruz just because he did the last time around — after sharing that Cruz voted with Trump to deport immigrant youth, he decided to take our literature and consider voting for Beto. The first wave of canvassers gather to prepare for canvassing on Saturday morning. You can find more photos from local and national canvassing for the #HereToStay campaign on Twitter.